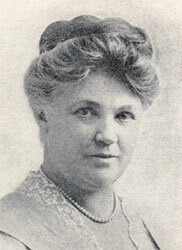 Annie Rix Militz was an American author, spiritual leader, and an early organizer of the New Thought Movement. She was also a key figure in the early days of the Unity Movement. Annie and her sister, Harriet Hale Rix, founded the West Coast Metaphysical Bureau, a group whose aim was to study philosophies and religions. In her early 30's, Annie attended a class taught by Emma Curtis Hopkins which would greatly influence her career path. In 1887 Annie,and her sisters co-founded the Christian Science Home, later renamed as The Home of Truth, an independent New Thought denomination. In 1890 she moved to Chicago to study at Emma Curtis Hopkins' Christian Science Theological Seminary where she was later ordained, along with Charles and Myrtle Fillmore. It was around this time that she married Paul Militz. Mrs. Militz was much in demand as a lecturer and teacher. She taught the monthly class at Unity headquarters in Kansas City in 1900, and travelled widely both at home and abroad. She became very active in the National (later International) New Thought Alliance, and also founded the University of Christ in Los Angeles (along with a major metaphysical library) to train New Thought teachers. She traveled the globe as an officer of the New Thought Alliance spreading the metaphysical gospel; and served as president of the New Thought Exposition Committee which organized the New Thought Day (August 28, 1915). The writings of Annie Militz emphasized healing methods and techniques for the development of mental powers. Annie Rix Militz will always be regarded as one of the greats of New Thought. She was a magnetic speaker and a visionary leader. She was an inpiring teacher and valued counseler in the International New Thought Alliance. Annie Rix Militz was never bound by any one partiular creed or teaching, but she held profound views as to ideas such as the nature of the universe, of God, and of man. Her one basic belief she said, was in "The Allness of God," no matter where or how it was found. In 1911, Annie Ritz Militz cut her ties with the Unity Church to promote her own emerging interfaith New Thought Teachings and to fully develop her Home of Truth Movement in Los Angeles. She also continued to focus her attention as editor and publisher of Master Mind, a New Thought magazine comprised of articles, poetry, lessons and other discussions on theology, bible study, prosperity, immortality, planetary healing, soul communion, healing circles, the home ministry and other various spiritual topics, which she continued to do until her passing. Centre For Inspired Living: What Is New Thought? - "The Awakened Life" from Unity Church of Christianity in Houston Texas with Reverend Howard Caesar.